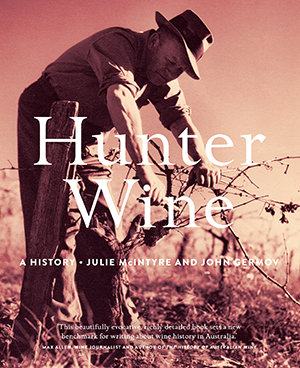 Hunter Wine: A History (2018, NewSouth Publishing) is written by two researchers, by newly-appointed Provost and Deputy Vice-Chancellor (Academic) at Charles Sturt University (CSU) Professor John Germov, a sociologist, and co-author Dr Julie McIntyre, an historian at the University of Newcastle. 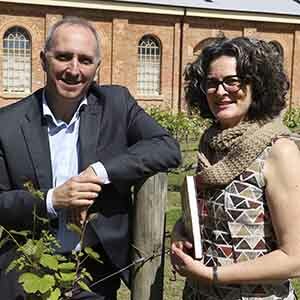 “The Hunter Region is Australia’s oldest continually producing wine region, but despite its long history, the Hunter wine region is largely absent from international wine histories and the Australian story,” Professor Germov said. “In writing Hunter Wine, my co-author Dr McIntyre and I eschewed a purely economic analysis and acknowledged that studies of commodities like wine often imply that products somehow produce themselves and ignore the fact they arise from people engaged in a social process. In Hunter Wine, Professor Germov and Dr McIntyre (both pictured below) trace six generations of the region’s wine community from the 1820s. They introduce forgotten characters, places and practices alongside famous names like Wyndham, Lindeman, Tyrrell, Drayton, Tulloch, McWilliam, and McGuigan, to reveal the Hunter’s pivotal role in making Australia an internationally renowned wine country. “Regions have been undervalued as sources of historical knowledge,” Professor Germov said. “So too, farming in Australia, such as wine growing, also remains under-represented in the grand narrative of rural development, if not regional and national identity. “The wine sector is economically significant in Australia, and the Hunter Valley accounts for two per cent of Australia’s wine production, and is one of the world’s iconic premium wine regions. As one of three nominations to a national award presented by the Wine Communicators of Australia, Hunter Wine: A History won the 2018 Best Wine Book Award in Sydney on Wednesday 7 November. The book is one of the outcomes from research that was jointly funded by the Australian Research Council Linkage Project scheme, the Hunter Valley Wine and Tourism Association, and the Newcastle Museum. Contact CSU Media to arrange interviews with Professor John Germov who is based at CSU in Wagga Wagga.